PRODUCT: 1-1/2" x .148" HOT DIP GALV FRAMING NAIL, 32-35 DEGREE PAPER TAPE COLLATED, FULL ROUND HEAD, SMOOTH SHANK, 2000/BOX, PRICE/BOX. DESCRIPTION: Full round head, diamond point. Joist hangers, foundations anchors, seismic and hurricane straps and ties, standard tensile, non-hardened. 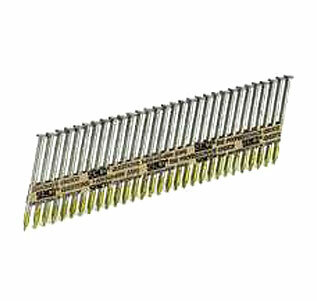 Fits Senco HN150 and HN250 tools, and most other 32-35 degree collated metal hanger / metal connector nailers which take .131 - .148 1-1/2" full round head joint nails.